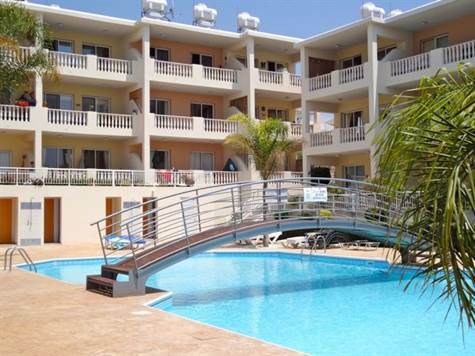 Kato Paphos, Paphos - This nicely furnished ground floor apartment is located in the popular area of Kato Paphos. Paphos Town and the popular touristic harbor area of Kato Paphos, are a few minute's away. The property features a spacious open plan living room including lounge, dining area and corner kitchen. The kitchen is well equipped with built-in oven, electric hob and extractor fan, fridge/freezer, microwave and washing machine. Off the living room is a hallway leading to two double size bedrooms with fitted wardrobes, and a family size bathroom. Sliding doors from the lounge and dining area provide easy access to a large covered terrace which overlooks the impressive swimming pool. Partitions on either side ensure privacy from the adjacent apartments, and it’s an ideal space for relaxing and outdoor dining. The pool area is stunning with lots of space around the swimming pool for sunbeds and plenty of shower and toilet facilities. There is an allocated parking space for the property, and full title deeds.